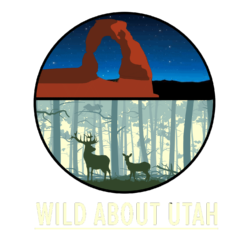 A few years ago the Utah Division of Wildlife Resources conducted a wonderful workshop for educators to provide them with materials to take to their classes to help students understand the many issues dealing with wildlife. As an introductory activity, the Ranger asked each of us to name the animal we thought that had the greatest influence or impact on ecosystems. People mentioned Deer, Cougars, Moose, Wolves and so on until it was my turn. Without hesitation I said “Beavers”. One of the teachers laughed at me and mocked my answer trying to embarrass me. So I asked the Ranger to repeat the question: Which animal did we think had the greatest influence or impact on ecosystems. “Oh”, I said making certain I had now understood the question. “In that case I have no hesitation now in saying the Beaver.” The room grew quiet, but the Ranger agreed with my answer. There is no question that all animals impact ecosystems. 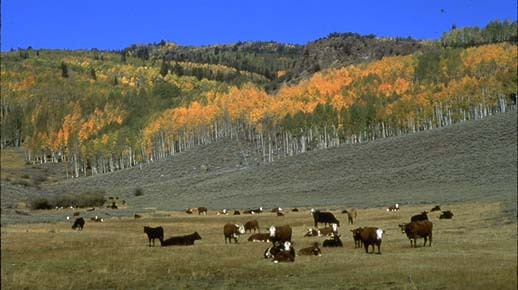 Heavy grazing or browsing by deer or elk can change the structure of forests and meadows. Predators, or the lack of them, can definitely alter what happens to those species. But consider the beaver for a moment. There are positive and negative things they do, but they definitely impact ecosystems. So consider this love-hate relationship humans have with them. And the deterioration of stream banks can occur. But in a natural setting, where they do not impact roads or developments, beavers can do amazing things. And they are basically constructed and maintained at little or no cost to humans. 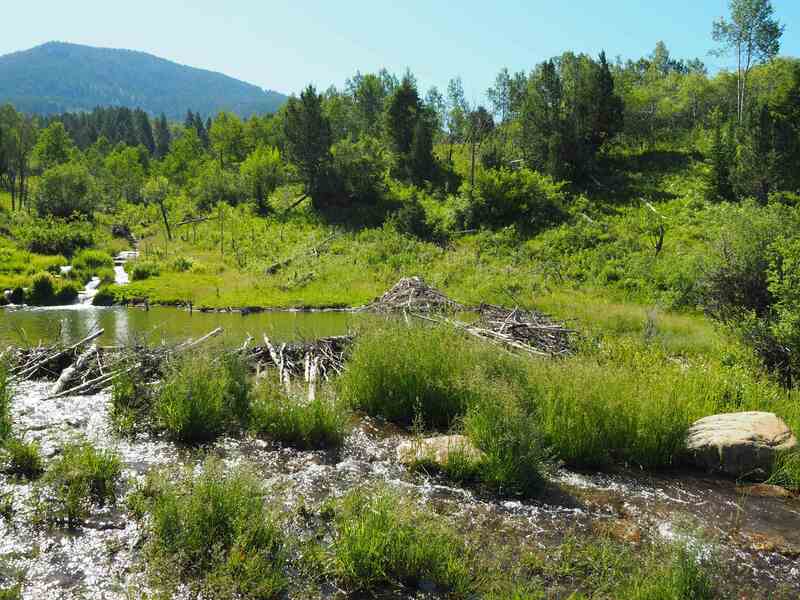 Utah State University, and the Division of Wildlife Resources, have been developing partnerships with landowners to help restore beavers in locations where they can succeed and provide benefits to the land, wildlife, and ranching efforts. 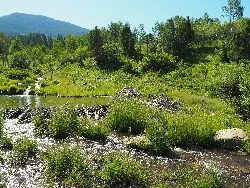 In areas where there are few trees, they construct Beaver Dam Analogues by pounding fence posts across streams, weaving willow branches between them, and plugging the base with large rocks and mud. 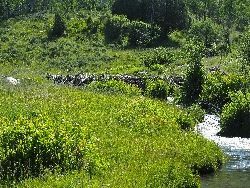 These are similar to natural beaver dams and give them a good start to build their own homes there. 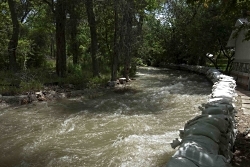 USU Watershed Sciences or the DWR to help relocate them where they can impact ecosystems in positive ways. I just returned from two weeks in the Peruvian Andes conducting field work on high elevation wetlands and how they were responding to impacts from livestock grazing in a changing climate. We were in the Huascaran National Park, the highest part of the Andes with many peaks soaring above 20,000 feet. Our Colorado State U. group was joined by students and faculty from 4 other campuses and the international Mountain Institute. These wetlands, or bofedales in Peruvian jargon, are essential in providing quality water for the thousands who reside below. 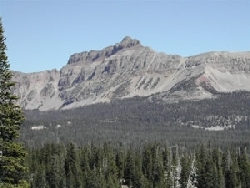 Having spent many forays into our magnificent High Uintah Mountains, I found myself reflecting on ecological and cultural parallels. Although our highest Kings peak at 13,528 feet was far below Mount Huascaran’s 22,205 foot elevation, its bold loftiness provides a similar experience as would standing on the Huascaran’s summit. A departure results from the highly glaciated Huascaran. Our Uintahs lost their glaciers around 8000 years ago from a warming climate. Unfortunately, Huascaran’s glaciers are following suit having lost nearly 30% over the past three decades. These changes were being compounded by poorly managed hordes of livestock which had overgrazed much of the landscape. Our primary focus was on changing vegetation, invertebrate populations, and water quality. At the peak of Peru’s dry, winter season, I wasn’t expecting to see much in bloom. To my delight, I recorded nearly 30 species of flowers in both woody and herbaceous form. 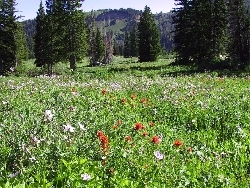 Tomorrow I will be leading a nature hike in the wetlands and uplands of Tony Grove Lake here in our Bear River Range where I expect a like number in bloom combined with a plethora of butterflies and birds. Although virtually all of the Andean flowers were new to me, there were similar families and genera. Of special note was a shrubby form of lupine growing to 5 feet, and another, exquisite columnar form approaching 6 feet found only in this national park. “Taulli Macho” is the local name for this splendid plant. “Macho” is a great descriptor! Birds and butterflies were no less baffling. All were new to my life list- Pona ibis, Andean Condors, giant coot, tufted duck, Andean flicker, giant humming bird, on and on. Senses overwhelmed. I missed the familiar sights and songs from our mountain birds- Clark’s nutcrackers, Steller jays, Cassin’s finch, pine siskins, violet green swallows, mountain bluebirds to name a few. I did a bit of research on our High Uintahs and found some parallels related to climate change and livestock management. Although not as profound as calving glaciers in the Andes, or hordes of free ranging livestock, a continued loss of our snow pack and resulting changes in hydrology compounded by certain livestock grazing practices are under close scrutiny by agencies and others. 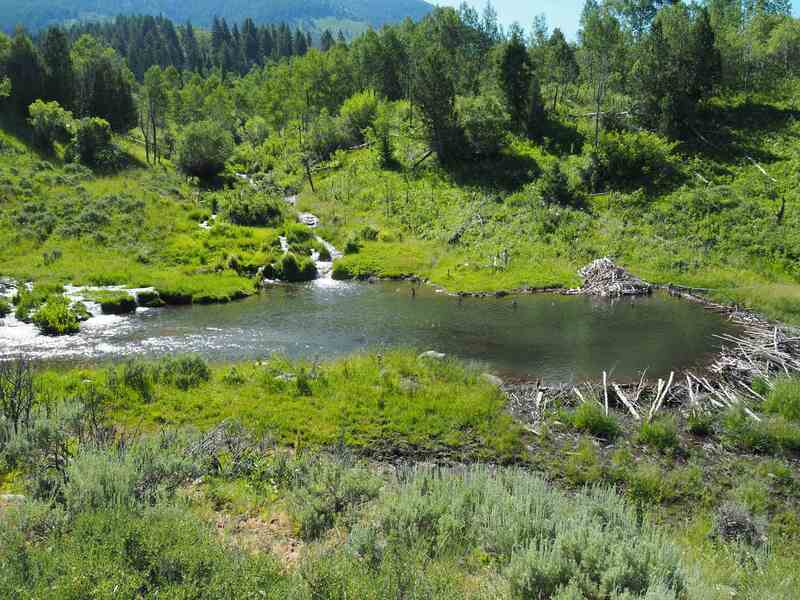 A recent publication “Assessment of Watershed Vulnerability to Climate Change for the Uinta-Wasatch-Cache and Ashley National Forests, Utah” published by the United States Department of Agriculture has much to offer. This is Jack Greene, and you guessed it- I’m Wild about Utah!! 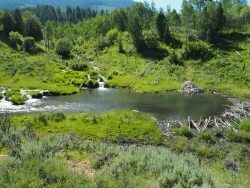 It’s springtime in the Rockies, and Utah’s northern rivers are engorged with liquid life- and have been for what seems like months now. After a winter of record snowfall, the spring heat and a miniature monsoon season have raised our local waters to levels not seen in decades. During this exceptional seasonal runoff, it’s easy to forget that we still live in the second-most arid state in the Union. Nonetheless, this seasonal plethora of the wet stuff is an ardent reminder that, even here, it is water we Utahns have to thank for our most prestigious landscapes and the diversity of flora and fauna that call these places home. It has, in most cases, taken quite a lot of time, though. Consider the Great Salt Lake: Utah’s most iconic landmark. It’s a remnant of prehistoric Lake Bonneville-itself the pluvial product of slow glaciation and rainwater collection. Thousands upon thousands of years of evaporative sun exposure, though, shrank Lake Bonneville and changed the local climate and ecosystem into what we have today, a salty inland sea implanted within an arid, Mediterranean climate. Though deprived of its acreage- and being immensely saltier than its predecessor- The Great Salt Lake supports an incredibly diverse and highly complex ecosystem. Concocted by the mixture of ancient salts and fresh water provided by the Jordan, Weber, and Bear Rivers, the wetland ecosystems on the fringes of the Great Salt Lake play host to millions of migratory birds each year that are travelling along the Pacific Flyway. 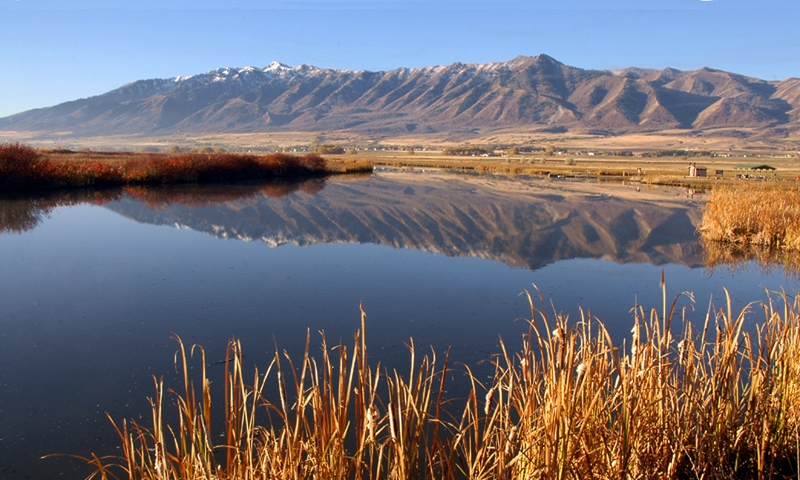 Without these oases, the diversity of Utah’s waterfowl-and wildlife at large- would dwindle drastically. One cannot speak of water’s effect upon Utah’s landscapes without singing the praises of the wondrous redrock canyons that dissect our state’s southern reaches. The force of water upon the high desert of Utah’s allocation of Colorado Plateau is intermillenial, hydrological poetry. Ancient Jurassic and Cretaceous seas deposited layer upon colorful layer of various sediments before heat, pressure, and the recession of shorelines turned them to stone. Water then went back to work within a new climate upon an old geography with rare but violent torrents of flashing floods that sliced ever deeper and more intricate cleavages into the sandstone. I remember visiting one particularly beautiful slot canyon with my wife. The fossilized wave action we spotted above the rim was preserved below as well with streaks of sediment mismatched and displaced into a beautiful kaleidoscope of reds, oranges, and purples. Water’s work was not finished here, though. Dispersed along the distant trail into the best parts of this remote canyon, there were desert riparian jungles of small cottonwoods, mosses, and ferns that harbored ephemeral pools dotted with water striders and even the occasional canyon tree frog. Water is a fickle beast, though- crucial to maintaining life but behaving without regard for its endeavors. The same forces of hydrology that created the Great Salt Lake, our richly diverse wetland ecosystems, and the stunning desert landscapes we love to explore can likewise wreak havoc upon our daily lives. 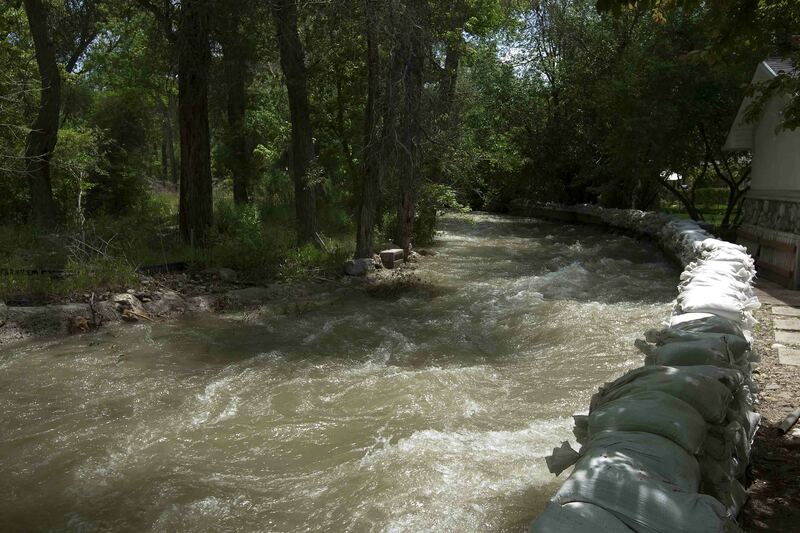 Consider the recent deluge in Cache Valley. 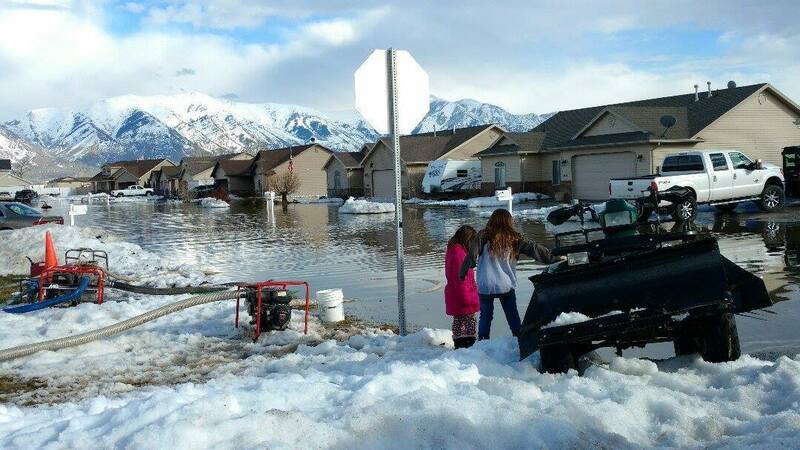 Several weeks ago, our northern valley was inundated with precipitation, leaving some families stranded in their low-lying homes with no access to the nearest road. A friend of mine who runs a canoe rental business told tale of making deliveries to homes so that people could commute from the end of their driveway to their front door. Perhaps no other force of nature can be so frustrating yet so gratifying; so plentiful yet so fleeting. It’s a wild thing, water. It is a miraculous ubiquity that, even in the driest places, leaves an indelible mark upon the landscape and the lives that inhabit it. Water flowing through the Great Salt Lake breach in 2011, when lake levels were high due to above average snowfall in the Wasatch and Uinta Mountains. 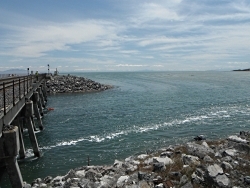 The Great Salt Lake breach is an area that allows water to travel between the southern and northern parts of the lake. There is a giant among us with a profound influence on our past, present, and future. My first encounter with this giant was both buoyant and delightful as I floated in the brine on a lovely summer day. But I was oblivious to the Great Salt Lake’s immense value as an environmental, cultural, and economic resource. A 2012 analysis by Bioeconomics estimated the economic value of the lake at $1.32 billion per year for mineral extraction, brine shrimp cyst production, and recreation. The abundant food and wetlands of the lake attract 3 million shorebirds, as many as 1.7 million eared grebes, and hundreds of thousands of waterfowl during spring and fall migrations. Because of this, it has been designated as a Western Hemisphere Shorebird Reserve Network Site. Due to its enormous surface area, it produces the “lake affect” which enhances our snow pack by an estimated 8%, a significant amount for both skiers and our available water. But our giant is shrinking. Since the arrival of 19th Century pioneers water diversions for irrigation have decreased its elevation by 11 feet exposing much of the lake bed. Natural fluctuations in rainfall and river flow cause the lake level to rise and fall, but there has been no significant long‐term change in precipitation and water supply from the main tributaries since their coming in 1847. For the first time since it was opened in 1984, water has stopped flowing through the Great Salt Lake causeway breach, an area that allows water to travel between the southern and northern parts of the lake. To significantly reduce water use, a balanced conservation ethic needs to consider all uses, including agriculture, which consumes 63 percent of the water in the Great Salt Lake Basin. There are no water rights to protect our Great Lake, so water development currently focuses solely on whether there is water upstream to divert. If future water projects reduce the supply of water to the lake, (such as the Bear River Development Project, its level will (most likely) continue to drop. We must look beyond the next few decades and decide how we value the lake for future generations. Lower lake levels will increase dust pollution and related human health impacts, and reduce industrial and environmental function of Great Salt Lake. We must be willing to make decisions now that preserve Great Salt Lake’s benefits and mitigate its negative impacts into the coming centuries. And where else could John and I have such a wonderfully buoyant experience? This is Jack Greene reading for Wild About Utah. 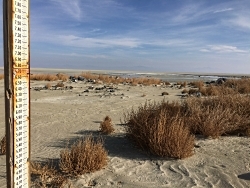 A gauge to measure lake water levels stands dry in the lake bed of the Great Salt Lake. For the first time since it was opened in 1984, water has stopped flowing through the Great Salt Lake causeway breach, an area that allows water to travel between the southern and northern parts of the lake.